Khosrow Golesorkhi, (b.Rasht 1322/1943 d.Tehran 1353/1974), poet, journalist, and revolutionary figure whose defiant stand during his televised show trial, and subsequent execution by firing squad in 1974 enshrined his place in the cultural and political history of modern Iran. Golesorkhi was born into a provincial family with strong ties to the Tudeh Party of Iran. He lost his father before reaching the age of two and was raised under the care of his maternal grandfather, a cleric in the city of Qom. After his grandfather's death , in 1962, he moved to Tehran with his mother where he worked while studying for his high school diploma. In the 1960s Golesorkhi began working as a journalist, literary, and art critic for a number of important Tehran dailies such as Ittela'at, Ayandegan, and Kayhan. During the same period he began publishing his poetry. Most of his mature writings and poems were published towards the end of this decade in influential literary and cultural journals such as Negin and in the leftist periodicals Sahand, and Arg. In 1969 he married Fatemeh Gorgin, a poet and journalist. Golesorkhi named their son Damun, a Gilaki word meaning "forest sanctuary," in memory of the Jangali movement of 1917-1921. His collection of prose and poetry were published posthumously after the 1979 Revolution (Gowharin, pp.7-8; Samakar, pp. 260-62). Early 1970s was the beginning of the guerrilla movement in Iran. This is when young, mostly educated middle class Iranians took the road of violence to confront that shah's regime. The Algerian, Cuban, and Vietnamese struggles as well as radical student movements in Europe and in both North and South America had a great impact on the intelligentsia od the third world, including Iran. The closure of channels of voicing critical views, culminating in the suppression of the Association of the Writers in 1349/1970, drove the young activist elements of the intelligentsia further towards radicalism. The radical opposition in the 1970s was spearheaded by two organizations, the Marxist Fadaiyan-e Khalq (Behrooz, 1999, pp. 51-70) and the Moslem Mojahedin-e Khalq (Abrahamian, 1989, pp. 81-145; Behrooz, 1999, pp.70-74). The guerrilla movement radicalized the oppositional spirit among many educated Iranians. Golesorkhi's poetry and events that led to his arrest and execution was reflective of this highly charged political atmosphere. His works were read by the young radicals, broadcast on radio stations of the revolutionary groups, and beamed to Iran from the Socialist Camp. This brand of literature was later called "poetry of the forest," with the latter having a direct reference to the first guerrilla uprising of Fadaiyan-e Khalq in Siyahkal forests near Rasht in February 1349/1971 (Talattof, pp.66-134; Samakar,pp.260-62). The exact degree and details of Golesorkhi's own involvement in underground political activities remain unclear. Not all the members of the group were in contact with each other, or even knew each other. 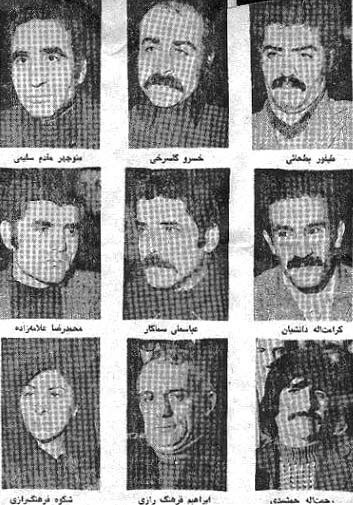 It seems that the trial of the group was an attempt by the shah's secret police (SAVAK) to exaggerate the danger of the armed opposition and to achieve a perceived success against the guerrilla movement, with accompanying propaganda value. The regime showed a degree of boldness, perhaps to make an example of the case, by putting the group on military trial in 1973 and early 1974, and broadcasting the proceedings on national television (Behrooz, 1999, pp.69). A number of the group's members confessed to charges for which little evidence was produced, and asked for the shah's pardon. They received light sentences. But the first five refused to confess, even after apparent extensive torture (Behrooz, 1999, pp.70). Golesorkhi and Daneshian went even further and used the fact that the proceedings were televised to put the regime on trial by refuting the charges and defending revolution and Marxism-Leninism. While Daneshian's defence was more subtle, Golesorkhi made passionate speeches until they were both stopped by the military judge. Golesorkhi defended Marxism by recalling that he had learnt the first lessons of revolution by following the example of Mowla Ali (b. Abi Taleb), the first Shi'i Imam and his son, the Lord of Martyrs, Imam Hosayn. Golesorkhi and Daneshian were executed on February 17, 1974 (Gowharin, Oh My Country, 1996, pp.10). The other three eventually asked for the shah's pardon without confessing to the charges and received life sentences. Golesorkhi and Daneshian signed their last will as "People's Fada'i" which could mean devotees of the people or could be an allusion to their sympathy for the Fadaiyan-e Khalq guerrillas. Nevertheless, there is no evidence that the two, or any other member of the group, had any actual connection to the highly secretive organization. As far as the quality of his poetry and theoretical writings about literature and art are concerned, Mohammad Shams-Langarudi, the writer of a detailed analytical history of modern Persian poetry (IV,p.3760), sums up Golesorkhi's contribution in these words: "The most influential incident in the arena of guerrilla poetry was the execution in 1974 of Khosrow Golesorkhi, the famous poet and writer. He was neither a great poet, nor an acute journalist, and not even a knowledgeable literary critic and researcher. But he was a consistent, sincere, and emotional revolutionary who, by delivering his impeccable defense of the deprived masses at the shah's military court, sacrificed his life for his beliefs." man dar kojaa-ye jahaan istaadeh-am? Maziar Behrooz is an assistant professor of Middle East history at San Francisco State University. A different version of this article was published in Encyclopaedia Iranica. * Abrahamian, Ervand. Radical Islam: The Iranian Mojahedin (London: I.B. * -------. Dasti miyan-e deshneh va del [A Hand Between Heart and Dagger], Kaveh Gowharin, comp. (Tehran: Kavosh Cultural Institute, 1996). * -------. Ey sarzamin-e man [Oh My Country], Kaveh Gowharin, comp. (Tehran:Negah Publishers, 1994). * Talattof, Kamran. The Politics of Writings in Iran (Syracuse, 2000).